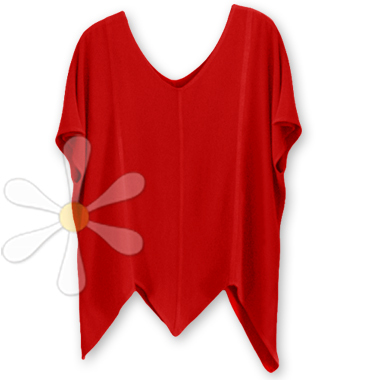 A unique and irresistible top shaped like a capital M with little wings for sleeves! It has a V neckline that's echoed by the fun and flattering pointed hem in front AND back. The cut is loose and flowy on smaller figures and deliciously adorable on the more voluptuous goddess among us... another example of design magic! The unique shape is just one of the many delights of this buttery soft piece. It's hand woven and hand dyed Morocco susti cotton that feels as soft and luxurious as cashmere. The quality of this free size top is simply superior, which you'll recognize immediately when you see the attention paid to details like the reinforced French seams. Like our entire susti collection, it will outlast the rest of your wardrobe by decades!